Back in November, I had a special treat: I got to visit my brother- and sister-in-law’s tiny infant twins! I spent an entire day doing nothing but holding babies. My own kid is 23, so it had been a long time since I’d gotten to spend that much time with babies. And never before had I gotten to be so close to tiny baby twins. Since I’m no longer young and inexperienced (like I was with my own baby), and since I’m not the actual mother tasked with keeping these babies alive, and since I’ve spent some decades now reading about attachment theory, spending the day with two tiny babies was a source of geeky fascination for me. My shoulders tense and tears well behind my eyes even now, remembering a time when my baby son cried inconsolably while I tried and tried to soothe him without success. I so desperately wanted to help him. I so desperately wanted to be a good mom to him. In trying so hard to help, my frantic efforts added static to the system, blinding me to the tiny initial changes in environment or in his body and cries that might have pointed me in the right direction. Though I eventually got him settled and taken care of time after time, the journey to get there could be rocky. Bless our little hearts! Twenty-three years later, I was calm and unfazed by screaming twins who exuded endless indiscernible needs. Twenty-three years of experience and therapy and mindfulness practice and education primed my body and my mind to be steady and open to reading the babies’ signals and to their parents’ astute suggestions. When Lottie suddenly shifted from gazing into my eyes to screaming from some inscrutable discomfort, my heart didn’t race. I stood up with ease, and ambled around the room, all the while tuning in to subtle changes in her body tone. Turning toward a particular corner of the room, I noticed a slowing of the tears. I paused, a pattern of shadows caught her eyes, and her breathing smoothed out. Rocking back and forth while staring together into a corner that to me would have seemed empty, soothed her and opened my eyes to how interesting mere shadows cast by a light bulb could be. Warmth that felt like sacredness spread between us. In my easygoing state of mind I could read her signals and respond in kind. Deep presence in each moment invited a real give-and-take, a back-and-forth between us, so different from the old days where my own worry and trying hard filled up much of the space between my crying baby and me. Moments of connected wonder and amazement shared with these babies made me start thinking about neuroplasticity. When I focused worried attention on my son’s crying, and anxious attention on my own inexperience as a mother, more frantic energy flowed through both of our nervous systems. And the subtleties of communication that could have been available within the connection between us got blurred. But when I focused interested and calm attention on Lottie’s crying, and curious attention on my lack of knowledge of her particular personality, my nervous system remained calm, influencing hers to settle. And I was able to discern actions between us and in the environment that led to her comfort and my wonder, impacting the structure of both of our brains in positive ways. While I watched how effective it was to pay attention to her crying in this deeply present way, I became mindful of the fact that the way I pay attention to my connection with myself affects the way energy moves through my own body and mind, impacting the structure of my own brain. Neuroplasticity continues throughout the lifespan, so even though my brain may not be growing as fast as an infant’s brain, it is indeed still growing. I’ve written before about the importance of inward curiosity, and about how being playful with ourselves when we’re learning new things improves the experience and quality of learning. For me, framing both of these concepts as ways of paying attention that can positively impact the structure of my brain wakes up an observing part of me that can choose how to pay attention! Remember: How we focus attention shapes everything. So if you focus attention on yourself with curiosity, playfulness, love and encouragement, your self and your brain will be shaped toward security and growth. 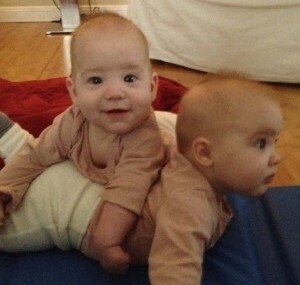 It’s so obvious when a life is new—like each of the twins’ little lives—that it is precious, unique, valuable. Let’s not forget that just because a life has been around for a while it doesn’t become less valuable. It’s the one and only life you get to have in your body, with your brain, with your set of experiences. Your brain and your self are with you for your whole life. Isn’t it worth choosing to focus attention on these treasures as if they were just that—treasures? Can you tell what kind of attention you turn toward yourself? Do you attend to yourself with love and encouragement? Or with harshness or anxiety or something else? Do different situations bring up different kinds of attention? What would happen if you paid attention to a distressed part of yourself with love and interest?